How to Play or Create WebM Video for Updating to YouTube? 1: Play WebM with supported browsers: WebM is support by Mozilla Firefox, Opera, and Google Chrome was announced at the 2010 Google I/O conference. Internet Explorer 9 will also be able to support WebM files if the VP8 codec is installed locally. Safari on the desktop supports any codec installed in QuickTime, allowing future WebM playback using QuickTime codec components such as Perian. Epiphany also supports WebM through the GStreamer multimedia framework. 2.With Media Player: DAPlayer is a Powerful, Simple to use and All-in-one WebM player software for windows that plays most audio/video multimedias easily and smoothly. 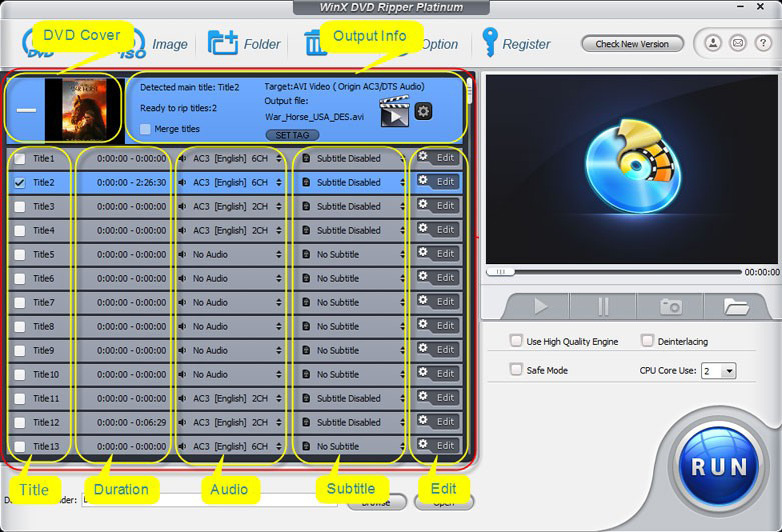 It is designed to give users a complete free solution for playing High-definition videos, which include Bluray, MKV, TS, MPEG4, H264 video formats as well as DVD video and music CD.Other WebM players such as VLC, Miro, Moovida and Winamp, have announced support. MPlayer is also able to play WebM files when built with libvpx. FFmpeg can now encode and decode VP8 videos when built with libvpx support, as well as mux/demux WebM-compliant files. 3. Plug-in: On July 23, 2010 Jason Garrett-Glaser, Ronald Bultje, and David Conrad of the FFmpeg team announced the ffvp8 decoder. Through testing they determined that ffvp8 was faster than Google's own libvpx decoder. mkvtoolnix, the popular Matroska creation tools, have implemented support for Multiplexing/Demultiplexing WebM-compliant files out of the box. Haali Media Splitter has also announced support for muxing/demuxing of WebM.Simon Phipps, a board member for the Open Source Initiative, expressed doubts as to whether the original WebM license was an open-source license, since it had not been submitted to the OSI for approval. In response, the WebM Project decoupled patents from copyright, offering the code under a standard BSD license and patents under a separate grant. The Free Software Foundation, which maintains the Free Software Definition, has given its endorsement for WebM and VP8 and considers the software's license to be compatible with the GNU General Public License. Never have heard of WinX DVD Ripper Platinum? It is one of the most all-pervading Windows DVD Ripper converter used by families worldwide. It is extremely fast to rip DVD to MPEG/MPG, MP4, MOV, FLV, etc., and even convert Paramount DVD to mobile devices such as iPad 4, iPhone 5, Samsung Galaxy Note 3, Galaxy S 4, Kindle Fire, etc. Here we just take ripping DVD The to hard disk (rip DVD to MPEG/MPG) video as the guide since hard disk is high in resolution, and great in portability. Then install and run it on your computer. Step 1: Insert the purchased or rental DVD in your computer DVD-ROM, click the "Disc" button . Or if you have copied the DVD to your hard disk, you can click the "Folder" button to find your source dvd folder. Step 3: Optionally browse and change the Destination Folder. The default disk to save the output folder is always C, which is however, not the best place for movie storage. So you may change it and classify the output folder of The Groods to your conventional disk and folder. This step is not a must-do. 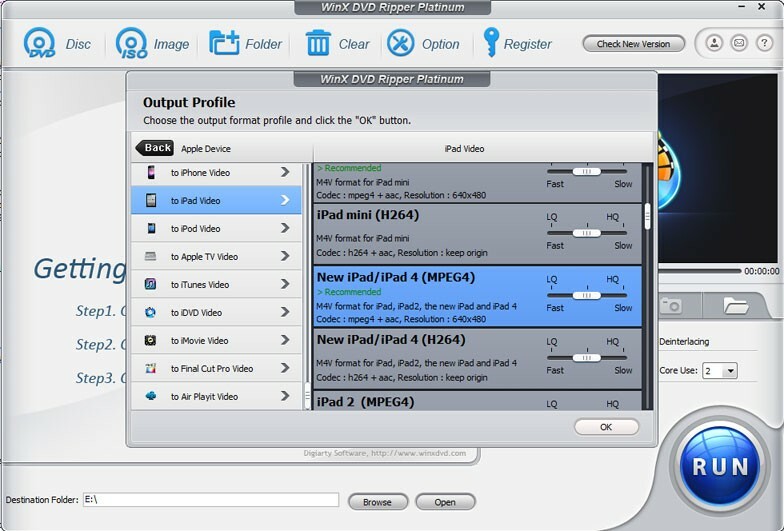 Step 4:Choose output profile,for example,i choose an New iPad pre-profile. Step 5: Click Run to begin converting DVD to hard disk. After that, you can play it freely on your computer smoothly without quality loss. Copyright ©2014 Weisoft Limited.All Rights Reserved. Users should note that our products do not allow you to copy protected materials. You may use the software to copy materials you legally purchase and own the copyrights, or at least obtain written permissions to copy from the copyrights owners.